motivational videos | Passion in Action! Passion in Action TV New Season Begins August 2! God-ideas to change the marketplace… and the world! I am very excited to announce the return of my TV show Passion in Action. Our goal is to equip and inspire you to be a Christ-centered, Spirit-led, purpose-driven change agent who understands your role in advancing the Kingdom of God in the marketplace and the world. The main focus of this season will be on bringing a relevant biblical perspective to on-going issues related to the economy, entrepreneurship, employment, and other connected topics that impact families and communities. For our upcoming season we are looking for Christian entrepreneurs, business leaders and community change agents who are having a significant impact in their circles of influence. If you’re interested in telling your story on Passion in Action please go to http://tv.paulwilsonjr.com and complete the guest submission form. We look forward to inspiring you to get your passion in action and change the world! God has given you creative potential to produce wealth (Deuteronomy 8:18). One way this is expressed is through faith-based entrepreneurship. This could be the answer to helping our country get out of this economic mess. Unfortunately, work challenges don’t just impact a person’s bank account. They also affects one’s confidence and clarity concerning their identity, purpose, and direction. My book Dream B.I.G. in 3D: How to Pursue a Bold, Innovative, God-Inspired Life! equips people with powerful inspiration and practical instructions to develop, discover, and drive to their God-given purpose, especially as it relates to your employment or entrepreneurship. Learn more at learn more at www.dreambigin3d.com. If you are unemployed and looking for a new job or are sick of your current one, make sure you’re using the right search criteria for your next work opportunity – that is criteria based on God’s purpose for your life. Your dreams are in process! No matter where you are in the process, God sees you and He still has His hands on you. Watch this motivational message recorded at The Potter’s House in Dallas, TX. 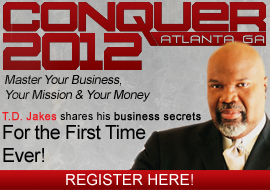 Learn more about resources for Christians to maximize their mission in business at www.3hrive.com. Seed Your Vision to See Your Vision! Great visions are birthed from small seeds. Faithfulness fuels godly success. Watch this motivational message from Lee Jenkins recorded at The Potter’s House in Dallas, TX. Today we celebrate the life and legacy of one of the greatest dreamers of all time, Martin Luther King, Jr. It’s interesting that many of the things he eloquently spoke of in his famous “I Have a Dream” speech in 1963 didn’t become a reality until long after his assassination. Fortunately the dream didn’t die with the dreamer. That’s because thousands (and maybe millions) took ownership of the dream. Its magnitude and reach actually multiplied after he was gone. How powerful is your dream? Will it die with you or grow after you’re gone?